Opened in April 2015, Ashford was formerly operated by Dobbies Garden Centre. 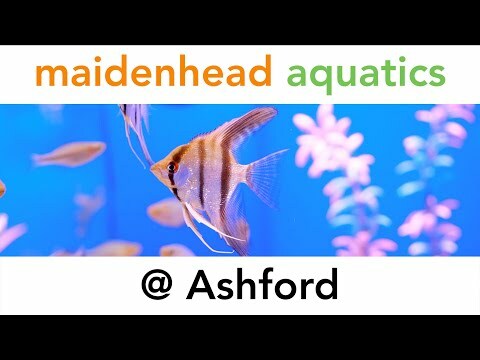 Although we're one of Maidenhead Aquatics' smaller stores, we certainly put on a good show for the fish enthusiast! We stock a wide range of coldwater and temperate fish, from friendly Fancy Goldfish to unusual Goodeids. If tropical freshwater fish are your thing then you are in for a treat. We aim to cater for everybody from the new fishkeeper to the seasoned campaigner. All our fish are properly acclimatised prior to sale and we don't let them go until we are confident that they are healthy. You can also see on display here some of the quality exclusive aquariums for which Maidenhead Aquatics have become famous. Planted aquarium enthusiasts are well looked after too, with regular shipments of quality Dutch plants and a range of dry goods to help your plants thrive. If it's marines you are looking for, then look no further! With a team of reef enthusiasts in store, we pride ourselves on the health and variety of our livestock. Our large pond section is brimming with lush pond plants throughout the summer months and our ponds are simmering with colourful fish, from long-finned Shubunkins through to high grade Koi Carp. In support of the amazing livestock, our pond dry goods area offers something for everyone, with a range of small water features up to large Koi pond filters. Our enthusiastic staff will be able to advise you on the best way to ensure that the water in your garden is always a pleasure and never a chore. Should you require something that we do not stock, ask a member of our team, as fishkeepers our staff will be only too eager to help.